Spirals play a very favorite role as motives for modern European paintings. Here we assemble some examples for quiescent spirals (Klimt) , spirals starting to move (Itten and Klee) and storming spirals (da Vinci, van Gogh, and Turner) . There are also circles or curved lines which look like spirals, but are not. 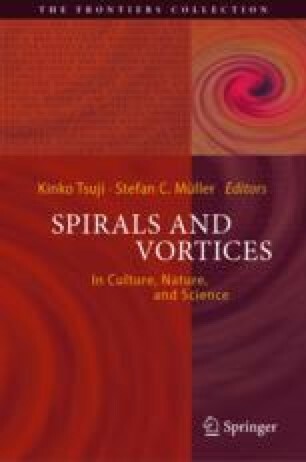 In parallel to the European culture, a lot of spiral patterns appear in Japan, as well: for example the famous Ukiyo-e of the Naruto whirlpools, patterns for Kimonos and toys. In our daily life spiral forms are used for practical and/or ornamental reasons: musical instruments, staircases, data storage devices like CD and DVD, and others.